THE CURIOUS CAT SPY CLUB has a new mystery to solve! 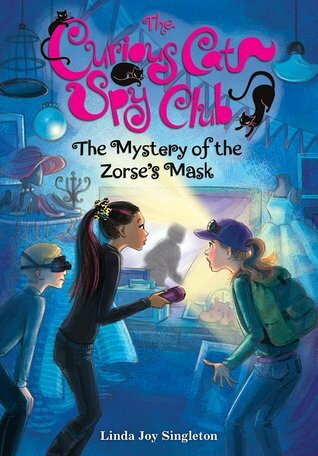 In THE SECRET OF THE ZORSE'S MASK, #2 CCSC, Kelsey, Becca and Leo are deetermined to uncover the truth about a mysterious stranger who claims to be the owner of Becca's beloved zorse (part zebra/horse). Following clues to a lost horse mask leads to a daring rescue attempt which puts Kelsey's live in serious danger. Does the CCSC have enough spy skills to solve the mystery? I really liked this book. If you like animal mysteries, then you will love this book! It is so funny! My favorite animal is Zed the zorse because he has been through a hard time, but still has courage for the future. My favorite part is when they find out who Caleb Hunter really is! I give this book 4 out of 5 stars and recommend it for ages 10 to 12. CHILDREN'S BOOK GIVEAWAY ENDING TOMORROW NIGHT!